Welcome to the Atworth Village website! An update of the Atworth Parish Plan has been published, dated September 2015. Download, print, or just read the document here: here. Many Atworth residents will know that Atworth has a defibrillator for assisting persons who suffer sudden and dangerous abnormal heart rhythms. There is an on-going programme of training for residents in the use of this machine. Details of the training sessions will be placed on the Events Diary page. This site receives in excess of 120,000 hits and over 60,000 visitors per annum. In order to make it of maximum use to residents and to potential visitors, and following the demise of the village magazine, I am trying to restart the Events Diary as a service to the village - naturally since ceasing production of the magazine myself, I was no longer in receipt of event details. Please send in your ad-hoc event details, as well as your annual programme of talks and meetings, to help restart the diary. There are forms for submission of your details on the Events Diary page - see the scrolling panel to the left. I have had some of the Atworth WI and Atworth History Group programmes; see the Events Diary page by clicking on the link in the left hand sidebar. NB. : there was a recent change in the History Group programme. See the Events Diary page for details. Paul Tyler took over the magazine from Kenneth Spencer (editor, 2006-2012) in January 2013. Paul's first four issues were funded (£270pcm) by the residue of funds left from Kenneth's editorial period, but through 2013, income did not keep up with costs, and Paul put the magazine online only during 2014, ceasing all publication early in 2015. Kenneth is too busy with other things to take the magazine back, but if anyone is willing to take it on, he will help them in any way possible. In 2012, Kenneth published a magazine production guide, for anyone considering taking the magazine on: it is still available here: publishing_guide_avm. A printed magazine of 32 pages and a colour cover costs approximately £320pcm, and Kenneth's experience over six years confirmed the magazine's viability and popularity with advertisers, contributors and readers alike, in the hands of an enthusiastic editor. Wiltshire Police and the Wiltshire Police & Crime Commissioner, in association with Neighbourhood Watch have announced a new joint initiative: the Wiltshire & Swindon Community Messaging Service. Sign up to the service to get messages about police & crime matters in their area, as well as community policing news, information about events, appeals for information, and crime prevention advice. Joiners may also seek to become involved in Neighbourhood Watch, including in the setting up of new groups. There are no obligations or costs associated with signing up which you may do here: www.wiltsmessaging.co.uk. All three books are available from .http://lulu.com/kaspencer. 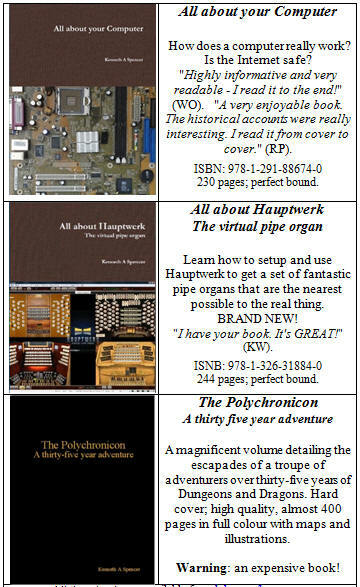 All about your Computer and All about Haupterk are also available from retail booksellers, and Amazon. You are now viewing the Atworth Village website, which in August 2006, replaced the original Atworth website created by Martin Beta. This website was created by Kenneth Spencer of KA Spencer (Software). The site is paid for by Kenneth, and was maintained in close co-production with the Atworth Village Magazine which Kenneth also published from August 2006 to the end of 2012. The Atworth Village website contains information on all aspects of village life in Atworth, serving all equally, not just one group, not just one organisation. If your organisation is not represented, simply use the email link below or at the foot of the page to start the process of getting your organisation onto the site. If you live in Atworth, or have an interest in the village, then it is your site. You will find links to the various sections of the site in the scrolling pane on the left of the page. Just scroll up or down and click on the section that is of interest to you. Please tell us what you think (webmaster@atworth.org.uk), and what you would like to see on the site. New messaging service: As we receive a great many emails from persons who once either lived in Atworth, or had a family connection with the village, we have set up a new arrangement for simple messaging . You can leave a brief message, and residents who may regularly read this website may reply to you and provide help in answering your question. You will find the link to the Old Friends pages in the scrolling panel on the left. This service replaces the Family History link, as that can no longer be serviced. If you are interested in Atworth from an historical perspective, you might like to read the brief Historical Note below. The note was extracted from various communications between the website author, Kenneth Spencer and Mr David Webb of Atworth, and with others. The Village of Atworth is situated in the west of the county of Wiltshire, approximately equidistant from the town of Melksham which is to its east, and the magnificent Georgian City of Bath, in the county of Somerset, to its west. With a population of about 1300, it lies along the A365 as it passes east from Box to Melksham. The co-ordinates of the Atworth Clock Tower, which is Atworth's most prominent monument are: N:53°23'33.45" W:2°11'57.27" A:73m. Although Atworth nestles in a rather idyllic rural setting (somewhat spoiled by the busy A365), it is within easy reach of the Wiltshire market towns of Devizes, Chippenham, Trowbridge, Bradford on Avon, Westbury, Warminster & Frome. The M4 motorway can be accessed eastwards to/from London via the A350 just north of Chippenham, or westwards to/from Bristol and Cardiff via the A4 and A46 north of Bath. The famous mapmaker and cartographer John Speed (1552 - 1629) shows Atworth on his maps of Wiltshire. 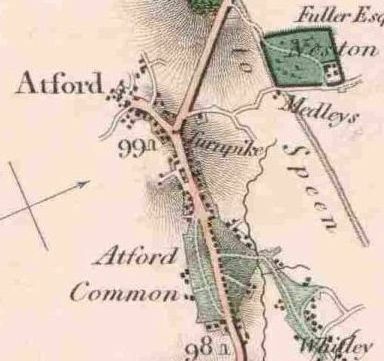 However, it appears with the name "Atford". Later, in 1773, the mapmakers Andrews and Dury, published a map of Wiltshire in which Atworth appeared as both "Atford" and as "Attworth". The "At" component of the name has been associated with the word "oat", which may imply a role in the service of grain markets of the time. When or where there may have been a ford in the village seems not be known at present. By the time the Ordnance Survey produced its first maps in the early 19th century, the village was almost exclusively referred to as "Atworth". 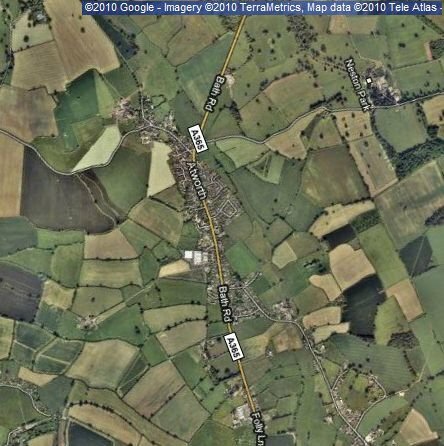 The change in Atworth ("Atford") between 1817 and 2005 can be seen on the two maps: the first is an extract from Edward Mogg's Survey of the High Roads of England and Wales published in 1817, and the second derived from the satellite image shown on Google Maps. View the maps more clearly here.